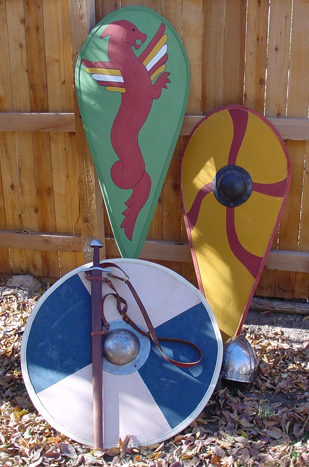 I have made three Dark Ages/Early Middle Ages shields - one round Viking shield and two Anglo-Saxon kite shields. 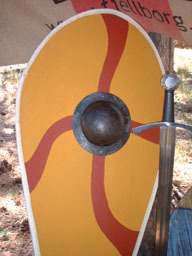 The Viking shield is made of 3/8" plywood on which I routered grooves approximately 6" to 8" apart in line with the grain to make it appear to be a composite plank construction. It is covered with canvas and milk-painted. I use milk paint exclusively since there is evidence that milk paint has been in use since the ancient Egyptians. And, of course, acrylic and latex paints did not exist during the time we're portraying. Milk paint consists of milk protein, lime, and color pigmentation - just as it did in ancient times. All my Dark Ages shields are edged with rawhide that is sewn on. Each of my two kite shields is made of thin layers of plywood that have been glued together and cured while tightly constrained to a 15" radius cylinder - thus giving them a cylindrical 15" radius of curvature. Again, both are covered with canvas, milk painted with designs copied from the Bayeux Tapestry, and edged with sewn-on rawhide. One has an iron boss and the other does not. Judging from the images on the Bayeux Tapestry, the majority of shields did not have shield bosses - though many did.